Though retailers should not expect customers to replace good customer service by using their apps in-store, the mobile app empowers consumers to compare prices, find alternative brands, and review product endorsements before making a purchase. However not all apps are created equal. Some apps simply provide access to product and price information. Others provide much richer experiences. There’s the concierge app that provides information to consumers looking to extend their shopping spree into an outing that includes entertainment or dining out. Still other apps give a preview of the sights and sounds of foods, fashions, and entertainment. Based on many studies Marketing Semiotics has conducted in the out-of-home food sector, we anticipate that consumers will increasingly expect a more visceral connection to the products offered at fast food restaurants than the photographs on merchandising boards and posters. At most fast food venues, the actual preparation of the food is hidden behind the service counter, disrupting the cycle between visual appeal, mouth-watering desire, and gratification available in the kitchen. The many choices consumers currently have for quick prepared sandwiches and other foods has created expectations for pleasure and choice heretofore unavailable in fast food. They may want to satisfy an impulse to pick up an appealing beverage or mouth watering dessert at the point of transaction, rather than ordering it over the counter. They may want to see the food being prepared. This first-hand experience not only communicates the authenticity of the products, but also delivers pleasure in form of the sounds and scents associated with real cooking, as they would in a pizza restaurant. 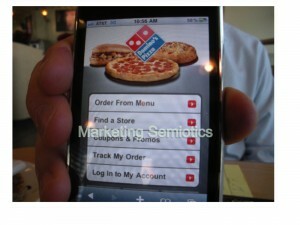 An Experience Technology: Domino’s App. Though nothing can replace the sensory appeal of real food preparation, a new trend in mobile apps takes the kitchen into the smart phones of diners. For example, today customers wanting a fresh pizza at home are more likely to be ordering and picking up food en route from work to home or driving around town, rather than waiting at home for the delivery person. This means that brands like Domino’s, whose core equities are associated with speedy home delivery, will have to realign their operations and marketing to accommodate the new mobile culture. The brand has an opportunity to redefine the pizza chain experience by redesigning the stores in ways that boost the sensory experience of customers at point of service, including opportunities for impulse purchases. Meanwhile, Domino’s has adopted the less costly, if less effective, response to this change in consumer culture by developing a mobile app that brings the menu, ordering capabilities, and product visuals to consumers wherever they are. The app gives consumers control over their orders and notifies them when the pizza will be ready for pick-up. Domino’s has taken the mobile app to a new level by taking customers through the various stages of forming, baking, and boxing their pizza orders while they wait. This feature not only gives customers something to do while awaiting their pick-up order but also simulates the mouth-watering experience of watching the various stages of food preparation in a pizza kitchen. Though this virtual experience cannot replace the real thing, it illustrates the potential uses of mobile apps for improving the customer experience.